With violence on our streets a widely discussed news topic right now, and a huge concern for parents with young adults, the second annual 'Unite Against Violence' walk - founded by the Homicide Victims' Support Group - is more important than ever. "To everyone who has been tagged, who comes across this post, has been a victim to violence, knows someone whom has been a victim to violence, has lost someone to violence, has witnessed a close call to violence and/or would like to come together with a group of committed individuals whom have experienced the harshness of violence, please feel free to join, share, and spread the word with as many of those loved ones you can. "Mark the date into your diary, the time has come, do whatever it takes to do your part in making a difference by walking against an issue that is ongoing and needs change, VIOLENCE!" 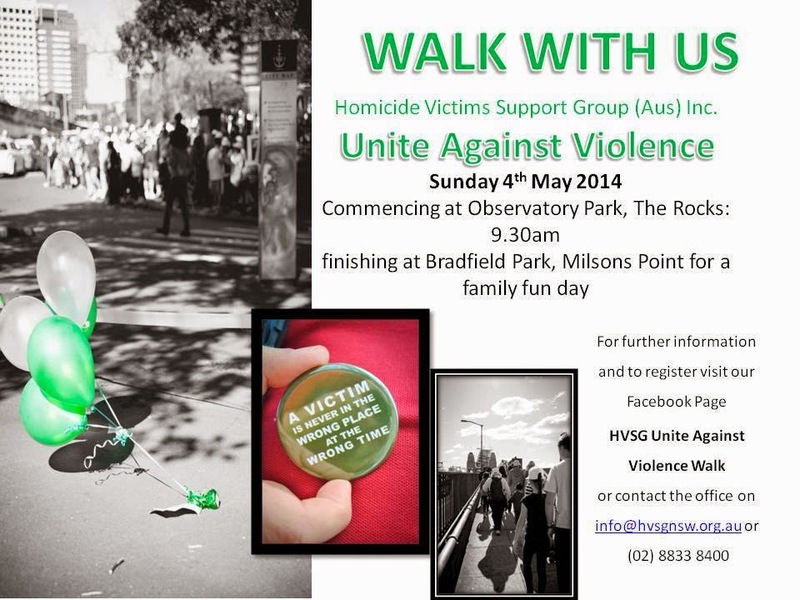 The event will be held on Sunday May 4, 2014, with the walk commencing at 9.30am sharp from Observatory Park, The Rocks. It will finish up at Bradfield Park, Milsons Point, and will be followed by a fun day for families, with face painting and a magician and lots of fun for all. A great day out for an event with a sombre foundation. For further information and to register for the event visit HVSG Unite Against Violence Walk 2014 , HVSG Unite Against Violence Walk or contact the office by email on info@hvsgnsw.org.au or phone on 88338400.